I wrote yesterday about the Daily Mail's initial online reporting of a ChildLine survey into the types of calls they had been receiving from children in 2005/6. I also took the time to post a comment on the Daily Mail's story, making the same point - namely that their reporting had extrapolated a conclusion from the figures that wasn't supported by the evidence. At no point in their report or press release did ChildLine claim that suicidal 5 year olds had phoned the service. 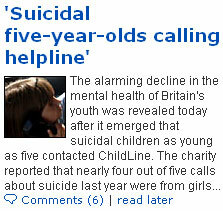 However "Suicidal five-year-olds calling helpline" was the headline that the Mail chose to use. The Daily Mail published my comment on their site. If you actually read the report ChildLine issued, it does not say that suicidal five year olds called ChildLine. It says that there were 42 phone calls by children between the ages of 5 AND 11. The other 96% of suicidal calls were by children 12 and over - which whilst it is still very sad. The other 96% of suicidal calls were by children 12 and over - which whilst it is still very sad is nowhere near the picture of suicidal 5 year olds portrayed in this article. For some reason, the last part of my sentence, criticising the Daily Mail's reporting, didn't make it through the pre-moderation of comments on the site. royalty-free, perpetual, irrevocable, non-exclusive right and license to use, reproduce, modify, adapt, publish, translate, create derivative works from, distribute, perform and display such Content (in whole or part) worldwide and/or to incorporate it in other works in any form, media, or technology now known or later developed for the full term of any Rights that may exist in such Content. I can't help but be annoyed though, that by truncating the end of the last sentence from my message, they have significantly changed the meaning. It now looks like I am complaining about the ignorance of fellow contributors to the site, not the standard of the Mail's journalism, and it makes my grammar look even worse than usual. All still attributed directly to me. Perhaps next time I should just post as "Disgusted of Salzburg" instead? By Martin Belam on 27 February 2007. Perhaps they edited your comment so it fits with their own editorial guidelines where grammar is concerned ... :D (She says in a poorly constructed sentence). Thanks for sharing and not letting it just slip through. Found your blog yesterday and am very much enjoying it. The Daily Mail have NEVER posted a comment from me even though I've ALWAYS been on-topic, polite and concise. They usually leave in (or compose themselves perhaps, i wouldn't be surprised) two or three slightly mad left wing comments to get the indignation juices of middle England flowing and their click rate up. I used to be an avid Daily Mail reader but I have ditched them due to their word-twisting sensationalist reporting. I have left several comments on the Daily Mail site over the last few months and not one has been published. It is patently clear that they will censor any comments that do not fit in with their views. Comments that call them out over their lazy, sloppy and cliche-ridden journalism will always be cut out.